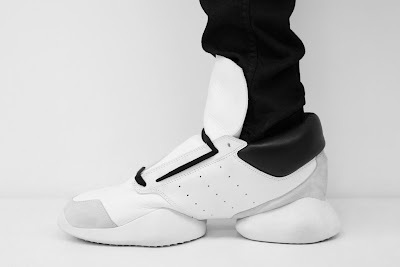 For spring/summer 2014 adidas teamed up with Rick Owens for a range of innovative footwear for men and women. As one of the leaders of fashion’s avant-garde, Rick Owens has defined an unmistakable minimalist, architectural and graphic aesthetic. For this collaboration, he distills his design signatures into a single silhouette composed of leather and nylon mixes in colors of black, white, gray, pearl, and bone. Like most examples of great design, the shoes arose from a practical need—Owens’ personal desire for chic sneakers to motivate his cardio efforts. The resulting collection features one trainer in six unique material and color combinations for men and four for women. Subtle yet instantly iconic, select models display only the slightest hint of branding: a barely perceptible three-stripe perforation along the side. Debuting this June at Paris fashion week, the collection will be on sale in December of 2013.